1. Taste. Local food tends to be fresher and riper, since it doesn’t have to be ‘durable’ for travel. Think fruits, veggies, and berries. 2. Health. Food can lose nutritional value with storage and transport. Fresh, whole foods nourish your body. 3. The Economy. When you spend money on local food, the money is much more likely to stay in the community, strengthening the local economy for everyone. 4. Neighbors. The farmers, farm workers, chef, cooks, bakers, and everyone working to bring us fresh food are your neighbors. Support them! 5. The View. The farmland and water provide us with some beautiful views around Whatcom county. 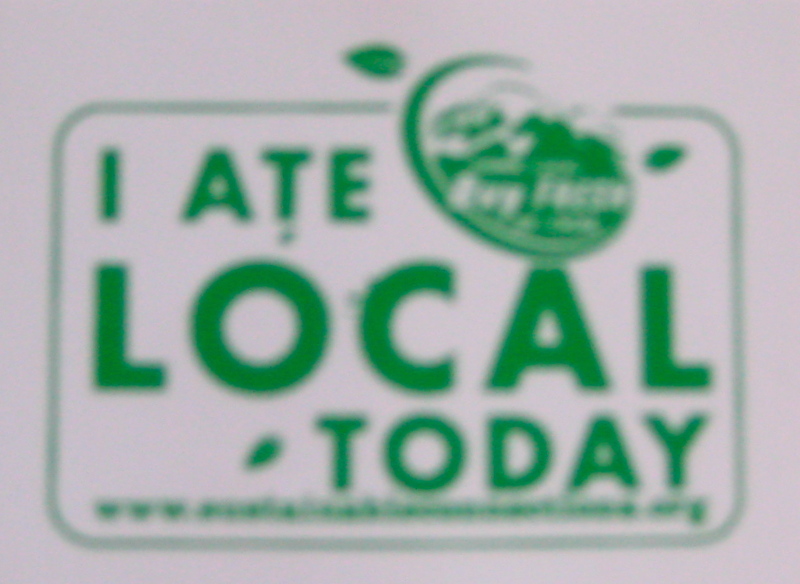 Buying local food helps preserve our gorgeous area. 6. The Future. Peak oil, climate change, and other evidence of an unsustainable culture are making us look for sustainable solutions. Local food is an everyday way to make an impact. Head down to a farmer’s market or your favorite local restaurant and make a delicious difference! For more information about local businesses taking action for a healthy community, check out Sustainable Connections. You might be also be interested in my post on the Fairhaven Farmers Market, happening every Wednesday through September.